The heart breaking saga of one mother gorilla, Shira at Frankfurt zoo as she continues to carry her deceased baby gorilla a week after its death. 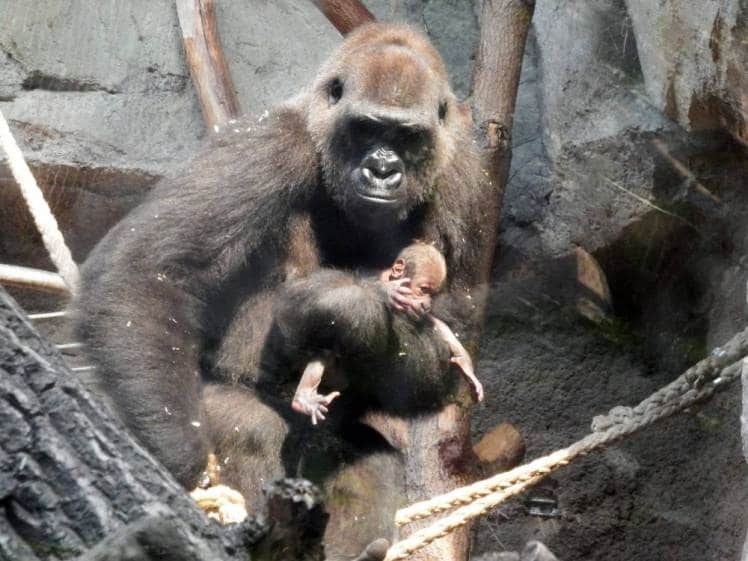 German tabloid Bild has published heart breaking images of resident Frankfurt zoo gorilla, Shira as the mother forlornly walks about with her deceased baby. This after the baby gorilla suddenly came to die over a week ago, with Shira unable to fathom the loss or giving away her child. 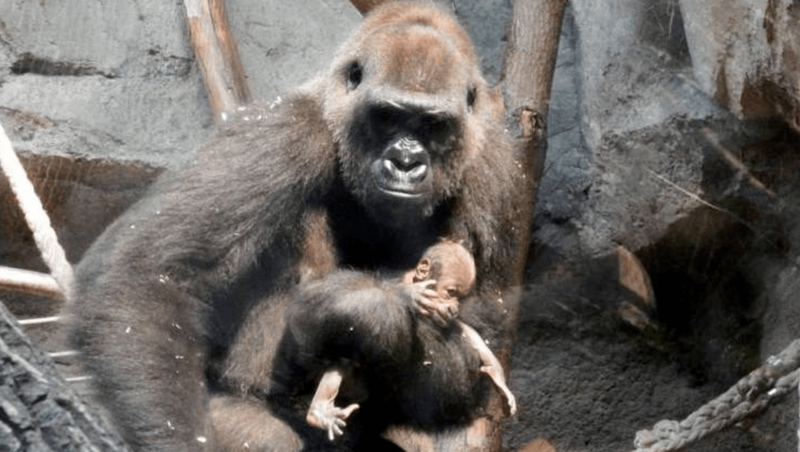 Images show the mother at times carrying the dead baby gorilla, cuddling her and even shaking the mammal in the hopes of somehow getting it to wake up out of its lumber. Reads a report via the dailymail: At night she lays the dead gorilla across her stomach and wakes up with the same perplexed look on her face when her baby doesn’t stir. The tragedy comes as the infant gorilla suddenly died without explanation just a week after being born. Zookeepers have told of waiting to retrieve the dead infant when her ten-year-old mother finally lets go of the corpse for an autopsy. Prof Niekisch said of her all-too-human reluctance to relinquish the baby: ‘This is often the case with gorillas. The bond between mothers and their babies is particularly close. ‘Shira needs time and space to come to terms with her loss.’ The baby is the second that she has given birth to – and tragically, the second to die. Sadly this isn’t the first time Shira has come to know despair as a parent, with a previous offspring, a son last May dying at the age of six months after catching a lethal viral infection. Then, like now, she cuddled and cajoled him to wake up in vain. Then, when she realized all hope was gone, she laid him in a quiet corner of her enclosure and walked away to mourn alone on her bed. ‘We will wait until she gives the baby up, retrieve it and find out what killed it,‘ added Prof. Niekisch.